Uses terminology suggested by James Zull in Art of Changing the Brain. for the Performing Learning Orientation. Each step varies for each learning orientation. The learner receives input from the external world through their senses. The learner experiences and processes the sensory input in the temporal (back) integrative cortex of the brain and tries to connect what is known and of personal value to associate new meanings and patterns. The learner tries to integrate or synergize new meanings in the frontal integrative cortex to create and test new ideas and solve problems. The learner executes the new ideas to perform and evaluate new actions (active learning). are repeated in an interative cycle (practice and feedback). 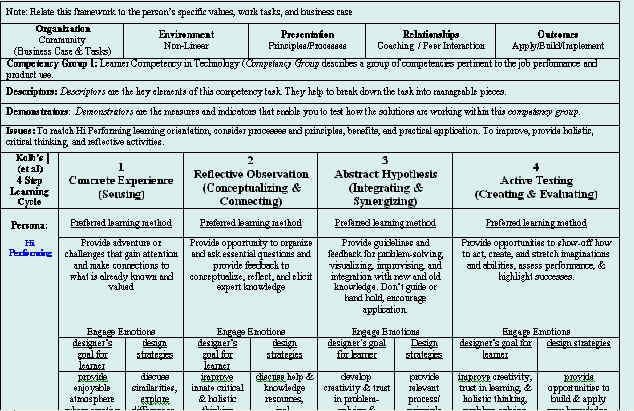 The templates shown above use similar four-step learning cycles such as those suggested by James Zull and David Kolb's |Experiential Learning Cycles. Kolb and many others theorized that four combinations of perceiving and processing suggest four step that comprise a learning cycle. Updated June 2006 by Margaret Martinez & The Training Place.